Key Difference: The lines of Longitude and Latitude are two set of imaginary lines that envelop the Earth. The lines of longitude run from the North Pole to the South Pole. The lines of latitude run from the East to the West. The lines of latitude are horizontal, as opposed to the lines of longitude, which are vertical. 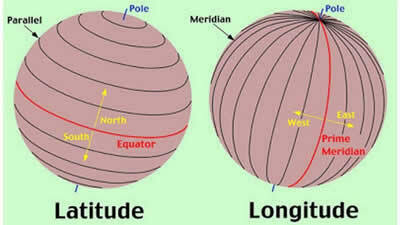 The lines of Longitude and Latitude are two set of imaginary lines that envelop the Earth. The earth has a vast area of surface. Due to this it is often hard to locate something exactly on the planet. For example: where is the Statue of Liberty located? One could say that it is located in New York City, but where exactly? Also, where is New York City? As both the Statue of Liberty and New York City are famous, one will exactly find it, however, what about places that are not that well know? What about a farm in rural Kansas? In order to solve this problem, the lines of Longitude and Latitude were developed, after a long struggle. The idea was that the lines would crisscross across the globe and form a grid. The measurements of the grid can then be used to pinpoint the exact location of something. The lines of Longitude run from the North Pole to the South Pole. Hence, they coverage at two points, the North Pole and the South Pole; they are also closer together as they get closer to the Pole. The centermost line of longitude is the Prime Meridian while runs through the Royal Observatory, which is located at Greenwich, England, a little outside of London. The Prime Meridian is labeled at 0°. All the other lines of longitude, which also called as meridians, are located exactly one degree apart, which translates to 69 miles. Each degree of longitude is sub-divided into 60 minutes, each of which is divided into 60 seconds. There are a total of 360° of longitude. They are labeled from 180° or 180°E to 0° (which is the prime meridian) to -180° or 180°W. Latitude, on the other hand, are horizontal, as opposed to the vertical longitude. They run from the East to the West. The lines of latitude are also known as parallels, because they are parallel to each other, this means that they do not interest with each other at any point, again unlike the line of longitude. The lines of latitude run from the east to the west. They are also located exactly 1° or 69 miles apart. While the lines of longitude are all exactly the same length, the lines of latitude are not. The lines of latitude get shorter in length as they get closer to the poles as the earth has a smaller circumference there. There are a total of 180° of latitude and are labeled from 90° or 90°N to 0°(which is the Equator) to -90° or 90°S. The centermost line of latitude is the Equator which is labeled as 0°. In addition to the equator, two prominent latitudes are the Tropic of Cancer and the Tropic of Capricorn. The area located between these two latitudes is known as the tropics, which is known to be hot and humid. The area located at the equator is the most hot and humid, and the reason for it is that it is because the equator is the closest area to the sun at any given time. 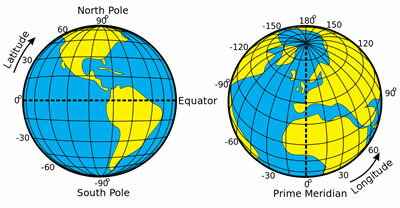 The angular distance east or west on the earth’s surface, measured by the angle contained between the meridian of a particular place and some prime meridian, as that of Greenwich, England, and expressed either in degrees or by some corresponding difference in time. The angular distance north or south from the equator of a point on the earth’s surface, measured on the meridian of the point. An easier way to pinpoint location. For navigation. Lines are not parallel to each other. They converge at the poles. The Prime Meridian is at 0° longitude. The equator is at 0° latitude. The lines are not of same length. They get shorter closer to the poles.